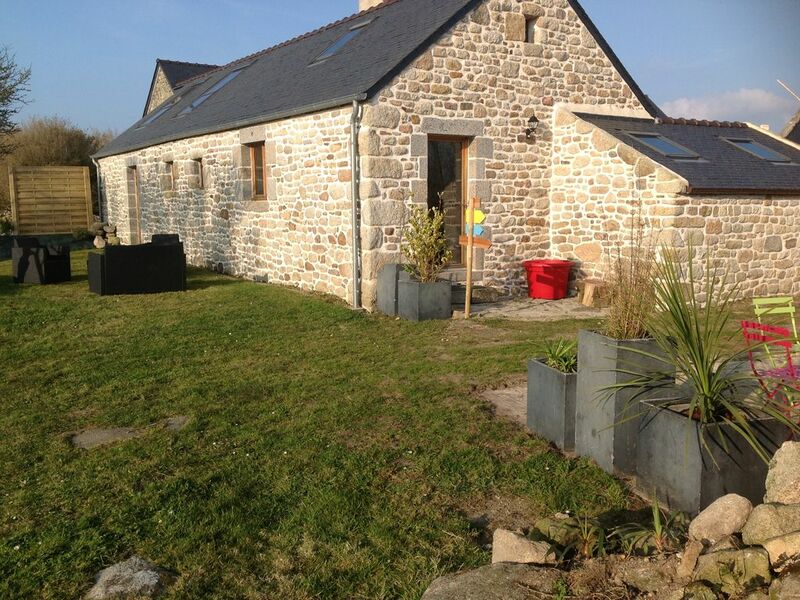 We welcome you in our beautiful Breton farmhouse of 90 m2 (2 to 6 people) between countryside and sea. Validated 3 stars by the tourist office. It combines the charm of stone and contemporary style, on a garden of 3000 m2 with sea view and facing the Ouessant and Molene islands. At 1800 m from the beaches and the GR 34, you can fully enjoy walks, water sports, idleness and many traditional festivals. Also nearby: 18-hole golf course in Plouarzel, nautical center, equestrian center, horse-drawn carriage ride, fishing trip, hiking on GR 34, discovery of the islands, discovery of the various markets with local products, Océanopolis (discovery of the marine world), the park of attraction "the recreation of the 3 priests", and the big novelty a water park on Lake St Renan "Aqua WEst Park" as well as various local festivals, fest noz and many others. Also nearby are restaurants such as "Le Mole" and "Auberge du vieux puits" where you can opt out of Brittany and other specialties. The farmhouse has a large living room with fully equipped kitchen open to the living / dining room (flat screen, Wifi, ...) a room on the ground floor with 1 double bed and 1 single storage, a room bath with its walk-in shower, double sink and toilet. In mezzanine, another room with 1 double bed and storage. Outside, a terrace equipped to spend friendly and relaxing moments. A cleaning fee of 90 € is proposed. If the cleaning of the cottage is not done, the package will be mandatory in the inventory of places of exit. Nous espérons y revenir une fois !! Nous espérons revenir l'an prochain. avons passé un agréable séjour dans ce très beau gîte. Gite très typique, très bien situé, vue sur mer et calme. Tout le confort et bien équipé. Prorietaires très accueillants sympathiques et dévoués. Je recommande ce gîte. ..
Merci à la famille Bodovit..
Magnifique! Das Haus ist wunderschön, liebevoll eingerichtet und liegt herrlich. Sabrina und Stéphane sind unkompliziert und herzlich - hier stimmt alles! Sehr zu empfehlen, wir kommen sicher wieder !